When good pasture grass is not available, hay is the single most important source of nutrition for your horse, pony, donkey or mule. It's said that hay revolutionized horse care, and man's ability to be mobile. Hay has been important historically and is still essential today. While pasture may be best, pasture grass may not be adequate during hot weather, drought or winter conditions and this means owners need to feed hay. It's not okay to feed just any dried fodder to horses. Horse owners must be particular about the type and quality of the hay they feed to preserve their horse's health and condition. In its most basic form, hay is dried grasses and plants. Learn about what plants go into growing good horse hay, how it is baled and how it can be offered to horses. Hay allows us to keep horses in climates and conditions not natural to horses. 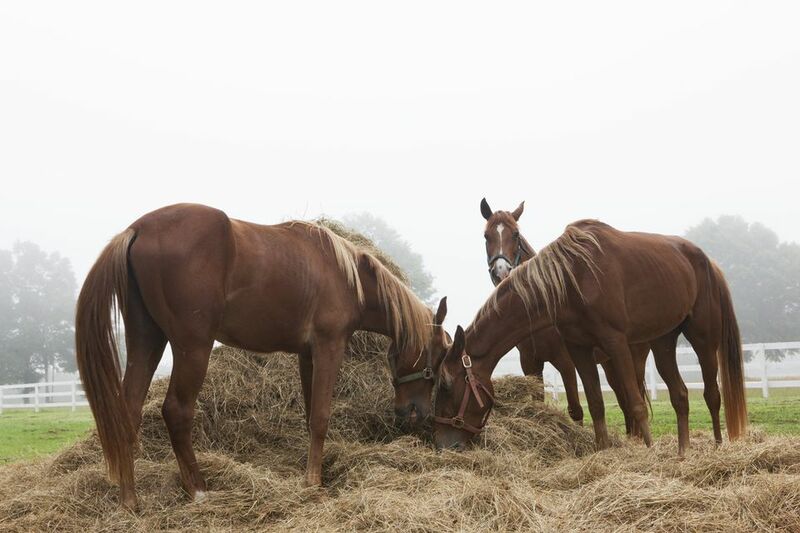 When grass is not available, hay may make up the largest part of a horse's diet. Hay can also be useful when keeping horses indoors, and while transporting them. Learn why hay is so important to horse owners. What Alternatives to Hay Are Available? Pasture grass can run out, and so can hay. During very bad years, when floods, fires and other natural or man-made disasters occur, hay can be in short supply. When hay is in short supply, owners may have to resort to alternatives. Of course, the best alternative is good pasture grass, but this isn't always possible. Here's a look at other fodders you can feed your horse while hay isn't available. Can a Horse Live on Hay Only? Can a horse live on hay, without pasture or any other concentrates such as grain or pellets? Find out if your horse can live on hay alone. Buying hay can be tricky. You have to know how to use your eyes, nose and understand the texture and makeup of good hoers hay. Many farmers bale their hay for cattle and don't need to be as particular about the quality as horse owners need to be. Here is what you need to look for to select the best hay for your horse. My Hay Is Only a Bit Dusty or Moldy-Is It Okay to Feed? If hay isn't baled properly, molds can grow causing dusty hay. Is it okay to feed your horse dusty hay? Is that bit of dust okay for your horse? Will it cause any problems in the short or long term? Here are your answers. How Much Hay Should I Feed My Horse or Pony? This is one of the most common questions about feeding hay. How much should you feed your horse? Too much can make it fat, too little and it will lose condition. Here's how to determine if you are feeding your horse the right amount. Is It Safe to Feed Newly Baled Hay? It's long been thought that it isn't a good idea to feed hay that is freshly baled. The main fear is that freshly baled hay could cause colic. But is this true, or is it an old 'wives tale'. Find out if you can feed your horse that newly baled hay you have stashed in your barn. How Long Does Hay Keep? Like any food, hay loses some of its nutrients the longer it sits. There are no 'best before' dates on hay. But here is a 'rule of thumb' regarding how long hay is good after it is baled.